Organizing your Desk will make you feel more organized and productive. Never ask yourself where your pencil is again. Never get all tripped up by the excessive amounts of Wires on your desk and in your way. Let people take your business card from an organized business card holder because who doesn�t want to do business with someone as neat, organized, and in control as you will appear to be? Washable Keyboards have a place, monitors are no longer taking over the desk surface, and mice can be wireless and off to the side. Filing Cabinets, safes, and Trash Bins to the side of the desk collect everything that won�t fit or belong in the tabletop drawers. 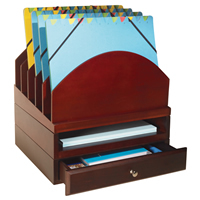 Larger Organization within the office will take a load off you and your desk. When you�re working at a Workbench or a Drawing Table, you might need to use computers to look at graphics, but you can�t have the monitor taking over your drawing space. Now, your keyboard and your monitor mount under and over the desk. Larger Wall Mounts, like television wall mounts hold monitors above your desk as well. Collection boxes, whiteboard signs for the desk, and suggestion boxes make your workplace more interactive with clients. Everything has its place and everything should be in its place because when you�re organized, you feel better and more relaxed. Productivity rises when you know where everything is and your desktop is not overwhelmed by wires and random papers. With these Desk Organization systems, you will never feel cluttered and out of control again. At least, not where your desk is concerned.